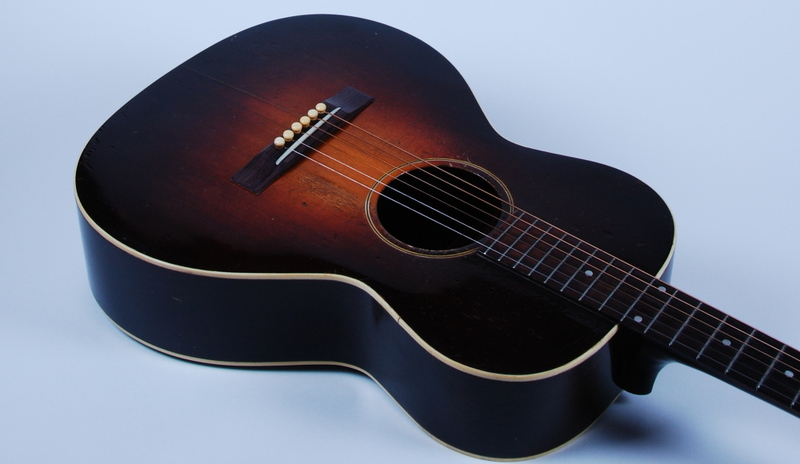 Gibson L-1 1931 | $3700 | At the close of the 1920s, Gibson was expanding its line from the so-called ‘peanut-shape’ flat tops that had been in production for a number of years, to include a larger-body flat top acoustic guitar. The result was a lightly-built instrument with a very comfortable neck profile and good tonal balance across the spectrum, and still favored by guitarists today. This example dates to 1931 based on its features .. twelve frets to the body (which places the bridge in the ‘sweet spot’ on the top), a thin maple layer between the fingerboard and neck (found on early Kel Kroydens), hand-rubbed ‘Cremona’ sunburst, and no pickguard .. and an FON of 100, listed in Spann’s Gibson book as 1931. The top is spruce, and the back and sides mahogany, bound top and back in white celluloid. The neck is mahogany, carved in a very comfortable and modern-feeling ‘C’ shape. The fingerboard is Brazilian rosewood with white pearl position dots. The face of the headstock is painted black with Gibson stenciled in white script. The tuners are original. The bridge and bridge pins are replacements. Scale length measures 24 7/8” and the neck is 1 3/4” wide at the nut. Overall the guitar appears to be in very good to excellent condition. The top shows one long crack below the bridge at the ‘A’ string. The entire guitar appears to have been lightly over sprayed (original finish is evident underneath). Frets and fingerboard show some wear in first position. the neck was recently reset and the action is set comfortably at 4/64”. Wayne Sanders is stamped in black ink on the inside center strip, a likely former owner. These early ‘big body’ Gibsons 12-fret flat tops are appreciated today for the comfortable neck, light feel, and great tone .. surely different when compared to the later 14-fret ‘L’ line. Comes with a newer hard case. Check out the sound clip below.